Recently after acquiring our long dreamt of 4X4 pickup truck, J and I had been pretty adventurous with it. We took it for the first off road, climbing over ‘mini hills’ at Pulau Indah. Indeed our first experiencing engaging 4 wheels was exhilarating, there some even said they have never engage in 4 wheels despite owning one for quite some time. After that, we went in search of something different and found ourselves going to the waterfalls! Oh yeah, our pickup went on its first crossing over a river, albeit a shallow and small one, but then again, it is just so cool. We had so much fun! We even wash our truck on the river itself, thanks to J’s ingenious idea, though later on we found there were no difference after the wash as the river water leaves some residues. Regardless, J and I had a lot of fun with it, and we definitely believe there is more to come. Anyway, after the adventurous waterfall ride, we along with a group of friends went to a special BBQ restaurant located at the foot of Bukit Tinggi on our way home. It is pretty special as there are a few dishes that we cannot (or I have yet to discover, would appreciate if you can introduce me if you know any) get in Klang Valley. Upon reaching there, our friend C (a great photographer which I found valuable in teaching me photography tricks and a tham jiak kaki to boot, I sense many more food adventures to come), who recommended this place with ‘must-eat-dishes went to the toilet, so while waiting we decided to order some drinks first. A big old wooden board written with boldly with ‘BBQ Juice’ caught my eye, so I enquired the lady who is there to take our order on what it is. She said it is their in house special blended juices of pineapple and carrot, no sugar added she stressed. So we all ordered one each, no ice and it came thickly blended, sweet despite no added sugar and surprisingly suitable, worth every ringgit of the RM5, but I wished it has a little bit more, as we finished off even before our meal ended. When we just started enjoying the juice, our toilet friend came back and started ordering the out of his experience. 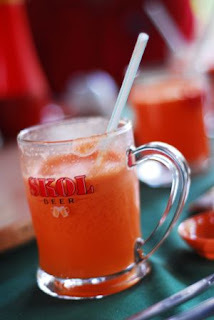 Just hearing his orders made me the more curious and the more tham jiak to try it soon. 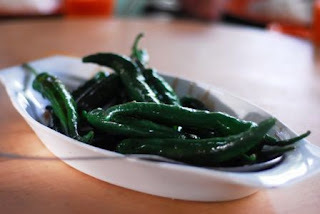 So first came a plate full of huge green chillies. Oh yeah, big crunchy chillies, lightly doused in dark sauces, gentle blend of soy sauce, oyster sauce and whatever Chinese dark sauce you can think of (this is my excuse for not able to make out the ‘special’ sauce. This dish was certainly a joy to bite into and don’t worry, the cook had ensure every single seed have been scrapped out, thus leaving the flavourful skin for us to enjoy without having to reach for water, mind you especially when our special edition juices is in limited portion. Then came the highly expected tower steam seafood, where you have medleys of clams, crabs, mussels and prawns that are steaming atop a tower like steaming pot. The seafood were just steamed freshly without much flavouring, for us to enjoy the goodness of fresh seafood, though sadly it was not that fresh (i am sorry, but the Chinese food critic side of me is kicking in), thus not as sweet and flavourful as it could have been. J the sole critic of this blog also mentioned that this dish does need some flavour, and i knew the lacking is the sweet freshness of it, but what do we expect from the foot of a hill? But this dish is still much worth the try, as it is certainly a fresh way to eat seafood, i would say the best way if you want to ask a Chinese, to fully appreciate the taste of sea. On top of this, the dish is not all that, it has something hidden. 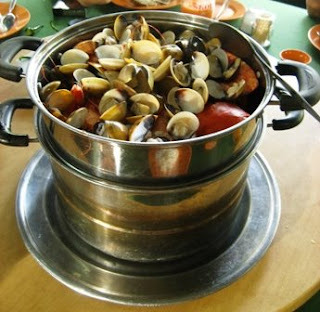 Underneath the tower, the pot is actually collecting all the steam juices from the seafood, and when it has enough, the cook came and took it away and then came back with, voila, seafood soup. Yum, this i have to give the thumbs up as it is flavourful with seafood juices along with vegetables and mushrooms, though a tad salty after you drink quite a bit but a wonderful match with white rice! Besides, C also ordered ‘shut san fei wu’, if reminded me of a Chinese drama that I used to watch, and in my mean I am picturing some snowy mountain far far away. Then the dish came and cure my wild imagination, it is actually salt crusted fish stuffed with garlics, green chilli, onions and chestnuts, barbequed to perfection, then serve with the crust open as if to show that it is flying. I would give thumbs up to presentation and taste for this one. It also reminded me of one of my favourite dish in Bangkok, similar in cooking style but stuffed instead with Thai cuisine must have, the lemongrass. This one also become my favourite of the lot instantly, J even start questioning whether I can make this at home, then my imagination started again with me using LOTS of flour, some water and LOTS of salt to just cover the fish and then set up bbq set to cook to perfection, so I look at him squarely and said no. Guess we had to make another visit to eat this again. Also not to forget, i had to mention that the decoration here is pretty unique as well. They hangs various style and brand of umbrellas at the ceiling and then line their wall with shelves that is filled with empty wine bottles. C said the corkage her for wine is free, but you have to leave the bottle for the owner to put it up for deco, it would be novel indeed to have yours immortalize here. Maybe the next time we visit, we can bring some wine.